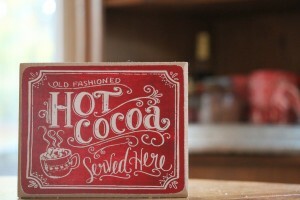 I know it’s not really Christmas decorating time, but it’s certainly hot cocoa time. Every year, I put my hot cocoa station on my kitchen table. My husband doesn’t like moving it every night, when we sit down for dinner. This year, I decided to try something different. 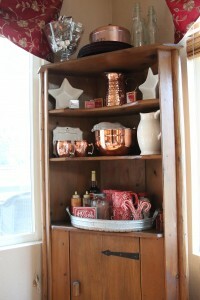 We have a cute little corner cabinet in our kitchen and I thought it might be the perfect spot. 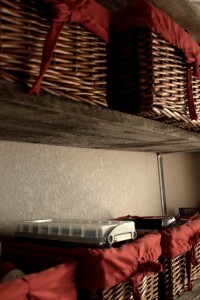 **Side story… When we bought our house, 13+ years ago, the previous owner had this corner unit. It was handmade by her grandfather and she loved it, but she had nowhere to put it in their new house. She asked if I’d like to keep it. Well, I love unique pieces like this! It’s so cool that you can see the hand carving. I bought a bottle of caramel syrup and two different types of caramel. My favorite type of hot cooca is Nestle Quick, made with milk. (Ok, my favorite is actually from Williams Sonoma but I can’t afford that all of the time. Nestle works well for the amount of cocoa I serve at my house.) I put that in the cute jar with the jingle bells. We also have some snowflake shaped marshmallows from Williams Sonoma, and I added the candy canes at my daughter’s request. Aren’t those mugs the cutest? I picked those up at World Market. I saw them on someone’s Instagram and knew I had to have them! I’m gradually adding some Scandinavian touches to my house and these are perfect. They are also very large mugs, which gets two thumbs up from my daughter. I stopped by downtown Snohomish the other day and spotted this little sign at Cinnamon Stick. That was a no-brainer. It needed to be the finishing touch on my hot cocoa station. There you go! 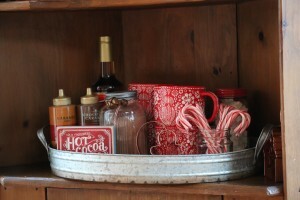 This is all you need for a hot cocoa station. 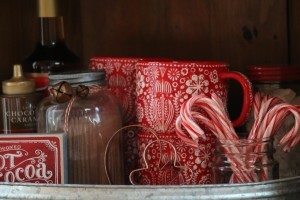 I usually don’t have to go shopping to create my hot cocoa station. Most of the time, these items are already in my house, but this year I really needed those mugs. And who could pass up a tiny little sign that fit perfectly into the tray? Happy decorating! And happy cocoa drinking! I’m feeling a bit like Joanna Gaines right now. 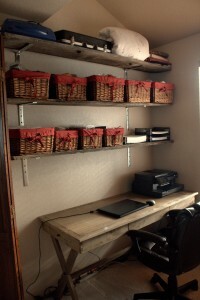 You see, a few weeks ago I decided that my hubby and I each needed a work space in the craft room/den. On days that he worked from home, I would clear off my sewing table and he would use that as his desk. I’ve been fine with sharing, but I decided that he really should have his own space. He was setting his computer on my cutting mat and whenever he reached for a pencil he’d grab one of my fabric/chalk pencils. It was time to give him a designated office space. I started by clearing out the book shelves and paper cupboard that were currently in the space. (My kids were calling me a hoarder through this whole process. IT’S NOT HOARDING IF IT’S IN LABELED BINS, PEOPLE!) Once the space was clear, we had room to move a desk and shelves in. This is the part of the story where I channel my inner Joanna Gaines. A couple of years ago I saw these pieces of barn wood leaning up against my cousin’s barn and started begging to take them home. They’ve been in my garage waiting for the perfect project. Well, the perfect project is this one! I had three long pieces of barn wood, which we only had to trim a little bit. I looked for cute brackets but couldn’t find anything that I liked. We ended up using L-brackets that really weren’t meant to be shelf brackets. They were sturdy enough and had kind of an industrial look. I still need to find a few office-type organizing pieces for the wall between the table and the first shelf. I was thinking about some sort of wire wall basket to hold papers, and maybe a few mason jars mounted to the wall to hold pens and pencils. This space is also pretty dark, so I’ll be on the lookout for a lamp for the area. We found the long skinny table, on sale, at Cost Plus World Market. 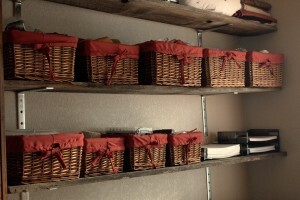 I already had all of the baskets. I wish they still sold them because I could use a few more now. Not bad for some reclaimed barn wood and an inexpensive table, huh? My hubby likes his new office space. I kind of think his favorite part might be not having to fight with all of my sewing projects for space. I was feeling pretty proud of myself for thinking of using these pieces of wood! I have to admit that it wasn’t ALL my idea. 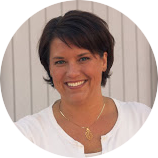 I just asked myself WWJD (What would Joanna do?). Now, if I could just tear down a few walls, find some rustic light fixtures, and add a few farm animals out back!! 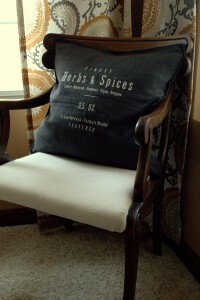 I’ve been looking for a pillow for the pretty chair in my dining room for about a year now. When I made my new curtains last year, I also recovered the chair that sits in the corner. It was one of those spur of the moment projects where the red and yellow toile fabric was just not cutting it anymore and I happened to have the perfect size of paint drop cloth to use on the chair. The chair looked great but it certainly needed a little something else. Creamish/tan fabric looks a little boring all by itself. I emailed my friend Courtney, over at The Golden Boys and Me, and asked her where she finds her cute pillows. She said she orders them through H&M. I have never been to H&M and I would never have even thought to shop there online, so I was glad to have the suggestion. 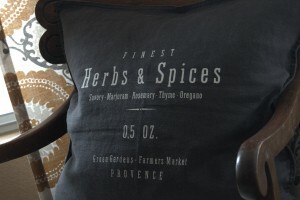 I spotted this Herbs & Spices pillow and knew it would be perfect in my dining room! I’m loving the charcoal gray! It looks perfect against the drapery panels. Don’t you just love the way a small change can just make the room?